I’ve figured out an interesting way to update this blog from my desktop. Previously, I would drag markdown files into my GitHub repo in the browser or use GitHub Desktop to push local changes to the remote. Using Atom text editor, though, I can now write, commit, and push markdown files directly to my remote site from the text editor! It’s truly remarkable. I don’t know how to work from the command line but it’s exciting that I can manage a site this way. I love the simplicity of plain text files written in markdown. And now, I can work right in the text editor to write new posts and make changes to old posts. Even better, the content stays consistent between my local computer, the GitHub repo, and this website. This stuff is fun. This post was originally written for r/AdvancedRunning. I haven’t posted to my Jekyll blog in a while, but I think I just broke it trying to publish a longer entry. My post excerpts on the main page are now broken. Ugh. I talked about my training at some length in a previous report, if you’re interested. Basically, I’m doing a Daniels’ 2Q Marathon Plan at 90-100k per week. 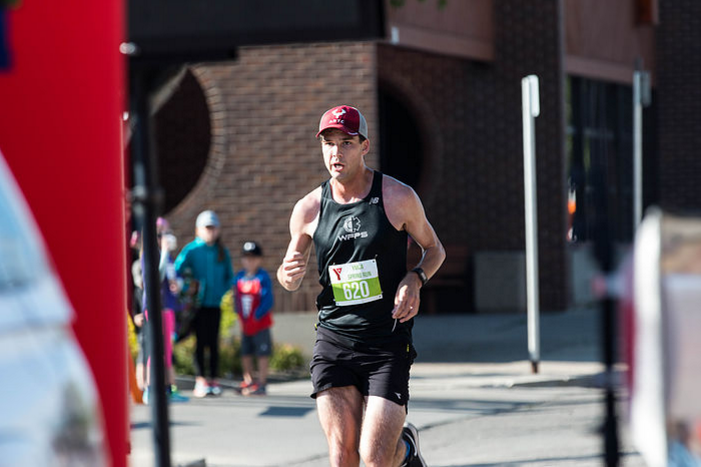 This race was a tune-up 3 weeks from my goal race, the Manitoba Marathon. This is one of the only local races where I live, and it started at 8 o’clock so I had quite a bit of leeway in the morning. Naturally, I still woke up at 3:30 AM. I tried to get back to sleep to no avail, but thankfully the Sunday Discussion Thread was posted a couple hours later so I was able to browse Reddit for a while and complain about the wind. I knew that wind was in the forecast but it was dead still when I woke up. I had a bagel with peanut butter, two coffees, and water before I left my place in my race gear and a warmup shirt. I got to the start line at about 7:30, but I had to wait a little bit for a friend so I could give her her race kit. With 15 minutes to spare I ran around the block a few times and then headed to the starting area 5 minutes before the gun, continuing my tradition of absolutely horrible warmups. It’s not a huge race so I was able to get to the front with the rest of the 20k runners (21 of us total) without any problems. I knew there was at least 1 guy who would be competing for the win, and we chatted a little bit about pace. I knew he would go out faster than I planned to so I didn’t say much about my goal pace. You can probably tell from the starting line that I was going to be running a lot of this thing solo. My basic plan was to go out at HM pace and try to hold on. I decided right away that I wasn’t going to chase for the win from the start, but stay consistent and hope that anyone in front of me would fade while I stayed on pace. I knew from a HM race three weeks ago that my endurance and strength are as good as they’ve ever been, so I had a lot of confidence that I could run the second half of the race just as well, if not better, than the first half. Sure enough, we go out fast (3:30-40) and I try to get in a rhythm. By about a half-kilometre I calm down a bit and by this time the leader has already gapped me just as I expected; he’s running 3:45s and I’m running 4:00s, and no one else running the 20k is hanging around at that pace. After 2 kilometres I’m passed by the 10k leader and the 5k leader, the latter of whom is absolutely gasping for breath and asking who’s ahead of me. I tell him that the 20k and 10k leader are, and he says “You are on a ridiculous pace!” between the heaviest gasps for air I’ve ever heard. Nonetheless, he’s a younger guy basically running 3:30s, so I’m not going match him. I find out later that he won the 5k in sub-18 or so. I guess I won’t have to worry about him unless he moves up in distance. The course is basically 2 5k loops that you run twice each. The middle 5k of the first time around was with a tailwind, which made it pretty easy to stay on pace. I wasn’t worried about catching the leader but I wanted to keep him in sight, just to give myself a chance. I knew that the biggest tests of the race would come at 8 and 16k, where there’s a 500 metre hill with a 25 metre climb. Before the hill I was in an excellent rhythm, between 3:55 - 4:00, but my pace dipped to 4:30 on the hill. It could’ve been worse but I knew I didn’t quite have the hill training I needed to power through at race pace, and I know that I need to add hills to my training anyway. I followed up the hill with a 4:10 km and then eventually got my pace back down to 4:00 - 4:05, even though we’re now running into a headwind. I knew that the middle 5k stretch into a headwind was going to be the hardest part to stay on race pace. Normally, I struggle with wind during tempo and interval workouts, but I didn’t run anything slower than 4:06 so it couldn’t have been that bad. My goal was to basically survive this part of the race so I could get to the second 5k stint with a tailwind. I picked back up to about 3:55 pace and my 15k split was around 59:30 or something around there. I tried to surge a bit as I came through the 15k timing mat but once I turned the corner to go back out to the east end I just didn’t have it in me to run any faster than 4:00. My last 5k was unimpressive, with a 4:29 on that ridiculous hill and a 4:14 to follow. The leader was probably a minute ahead at this point. I had known for a while that I had no chance to make up the difference but I still had a shot at going under 1:20, so I closed as hard as I could and crossed the finish line in 2nd at 1:19:51. After I finished, I congratulated the winner on his race. Friends of mine were also at the finish line so we chatted a bit while complaining about the wind and the massive hill. I had some gatorade and water while I waited for my first-ever podium medal. It was a race of 21 people but I’ll take it. Two years ago I ran this same race in 1:33:39. The winner of that year finished at least 12 minutes before me, and I remember someone dismissing my time and placement by saying that “12 minutes is a lot at the level.” I will never forget that comment, and I’ll enjoy my 14 minute improvement until I’m moving on to the next goal. Three weeks until the Manitoba Marathon! I’m currently doing a marathon training plan from Daniels’ Running Formula. It is in the 18-week 2Q program, 56-70 miles per week (90 - 113 kilometres). If I could summarize the program, it is basically 2 workouts a week: one medium-long run and one long run, with lots of tempo, interval, and marathon-pace running in the workouts. The rest of the mileage is easy or recovery and is basically up to you how you spread it throughout the week. I’m training for the Manitoba Marathon on June 18th, and the week leading up to this race was Week 12 of the program. I had a decent stretch of training throughout April, with 4 weeks over 100 kms, so I decided on a whim that now might be a good time to chase a half-marathon PB to give me some confidence. After a lazy January of 40-50 kilometres per week with almost no workouts, training started in earnest in February. I averaged 80k per week with one down week due to weather (it’s cold where I am and I’m a wimp). My long runs were between 24-26 kilometres, and I had one solid marathon-pace (4:35 /k) workout with about 18k of volume at pace. In February, I did a grand total of one workout at (or faster) than half-marathon pace, which was actually an interval workout in Daniels program: 6 x 1k @ 4:10 /k. March got off to a terrible start because it was cold and miserable outside, and I took an entire week off. I’m not proud of it, but it is what it is. I ran one 80k week in March, with one tempo workout (3 x 3k). I also travelled to LA but managed to run 40 kilometres that week, far short of the 90-100k I’m supposed to be running on this plan. I closed a terrible month of training with another 80k week with 2 workouts: 2 x 7k @ Goal HM Pace (4:15) and a long run with 16k @ MP (4:30). As the calendar turned to April, I realized that I had less than 12 weeks until the Manitoba Marathon, so it was time to either get serious or quit running altogether. It was workouts #2 and #3 where I realized that I might be in better shape than I thought, especially given my mediocre and inconsistent training. Nonetheless, this was my first month where I ran more than 100 kilometres a week, and the volume was clearly working. My workouts were generally going well (with a couple exceptions), so I figured I could give a decent effort at the half-marathon. I set my PB (1:32) last year at the tail end of marathon training so I had my sights on the elusive sub-90. There was one problem, though. I’m on a marathon training plan, so a lot of the workouts in the Daniels plan are targetted at marathon pace. In case you weren’t keeping track, I did a grand total of six workouts at or faster than half-marathon pace. That doesn’t seem so bad unless you think about the fact that it was over 4 months of training. Stay tuned, because this lack of HM-specific training becomes important, and I learned a valuable lesson yesterday. I was in Winnipeg for a work conference at the end of the week. I was intent on keeping my weekly volume up, so I wasn’t fully committed to a taper. I ran 8 kms (recovery) on Thursday, 14 kms (easy) on Friday, and 6 kms (shakeout) on Saturday. I stayed at a friend’s house and avoided drinking too much, but Saturday I went out for a few beers at a brewpub in the evening. I still managed to fuel well and stay hydrated and was into bed by 9:30. I was up early on race morning and my routine was going perfectly: coffee, water, and snack (trail mix bars). I had to drive about 20 minutes to the start. I was merrily on my way to the event when I realized that I forgot my watch! Thankfully I had banked quite a bit of time when I left, so I could go back and get it and still make it to the start with time for a warmup. I felt a bit hungry, too, so I stopped for a plain bagel with peanut butter. I ran a few strides and did a few drills, but my warmup was ultimately rushed and pointless. I probably went to the start line just as cold as I would be if I didn’t bother with the warmup. Conditions were basically perfect: 10 degrees C with a tiny bit of wind and scattered clouds. My plan for the race was to go out at 4:10 or 4:15, the latter of which is just under 90 minute pace. From my training, though, I really didn’t know what would be comfortable, so I planned on adapting after the first few kilometres. I felt really cold and tight the first 5k and it showed. Still, I was running around what I expected, with only my second kilometer (4:18) being a bit tardy. Several runners had taken off in front of me, probably a total of 20. I didn’t get passed by many in the first 5k, but a lot of the runners were pulling away from me. I didn’t mind because I was running my own race. I knew at the time that there were probably fewer than 10 people who can run under 4:00 pace in this race, so there was no point in trying to challenge the people who were going out that fast. After 5 kms I picked it up a bit, but I don’t remember consciously doing so. I think I was just feeling looser at that point and decided to stride it out to see what my body could handle. After feeling tight for over twenty minutes, I was starting to feel more comfortable. I don’t remember how many people I passed, but suddenly I’m running 4:00 - 4:05 pace and surging to catch and pass people who are in front of me. This was a terrible strategy that somehow worked, because no one I passed ended up catching me, but I was right on the threshold of pushing too hard. In the moment, I think I used it as a bit of motivation to not fall off pace – basically, I would pass people and try to keep holding on for fear of them catching me and making me look like an idiot. While all this is happening, I’m scolding myself while looking at my watch every split. I’m running 4:00 pace in a half-marathon, which is my interval pace for workouts of 1k repetitions! This is stupid and reckless. Still, I didn’t feel like I was falling off, so I just tried to stay in rhythm and focus on a steady cadence. From kilometres 17-19, my pace dipped a little to 4:08, which is closer to a more realistic goal for me. I think it was because of the wind. Nevertheless, I still passed a few people as I came up to the final stretch. I managed to get my pace back down to around 4:00 for the last two kilometres, where the crowd support was a lot better and I felt like I wasn’t going to crash and burn like I have in sub-90 attempts before. For a pace that I didn’t train specifically for, I felt incredible. I couldn’t close any harder than 4:00 pace but I felt like Eliud Kipchoge coming down the straightaway in Italy. I came in at 1:26:14 in 11th. As I crossed the finish line, I was basically in disbelief. I was ecstatic about my performance but I didn’t know what to do next other than grab some breakfast and linger around. I knew a couple other people from my city were there but I only found one of them and we chatted about the race and training. The biggest lesson, I think, is that volume is king. I only did 6 workouts that were remotely close to the pace I ran in this race. The rest of my running was either easy or moderate intensity – 45 to 80 seconds (per km) slower than race pace. But I ran the highest mileage I’ve ever attempted, and I’m only two-thirds through the training block. These are from my watch, not Strava. It’s hard to say which is more accurate, because they’re both based on GPS data. If lying and being lied to are universal experiences, it is still tempting to see the preoccupation with these stories as a peculiarly American trait. Self-invention is the founding subject of American literature. We celebrate the self-made man, and honor the dream of transcending one’s origins; we are suckers for people who invent themselves from scratch. Aeon consistently delivers interesting content about the intersection of technology and philosophy. Most of their articles address how technology affects what might be called “humanism.” I recommend this article if you’re interested in how this hope of a “technological utopia” is undermined by the same basic problems that have plagued humanity since as long as we’ve been around. By now, the answer should be obvious: [the problem of trust] ends with other humans. Blockchains don’t offer us a trustless system, but rather a reassignment of trust. Instead of trusting our laws and institutions, we are being asked to trust stakeholders and miners, and programmers, and those who know enough coding to be able to verify the code. We aren’t actually trusting the blockchain technology; we are trusting the people that support the blockchain. The blockchain community is certainly new and different, and it talks a good game of algorithms and hashing power, which at least sounds better than tired slogans such as Prudential is rock solid and You are in good hands with Allstate. But miners aren’t necessarily any more reliable than the corporations they replace. LookUp is far and away my favorite dictionary app I’ve used. While some of its functionality clashes with Apple’s Look Up feature, what it offers in simplicity and effectiveness differentiates itself from the stock option. iOS really needs a mode where you can keep apps active, but hidden. IFTTT is one of the few apps that I need to keep open constantly, but I dislike it being in my system tray. A two hour run on Valentine’s Day is an act of self-care, even when you crash and burn on the workout portion. Jack Daniels’ 2Q marathon plan calls for difficult workouts from the start. Today was 10k easy followed by 2 x 4k at tempo pace. Normally that’s a decent effort, but it’s doable. After a long warmup at a moderate effort, though, the pace puts a lot of stress on your body. Happy to be done with it! If anyone is curious, I setup this Jekyll blog without touching the command line by using this repository: Jekyll Now. And in order to quickly publish microblogs from my iPhone and iPad, I’m using this Workflow: Microblog Post to GitHub. For longer entries, I expect that I’ll still work from 1Writer and Working Copy, a powerful Git client for iOS. I wrote about setting up that workflow for a site built with Grav, but the system is basically the same. Yesterday marked the start of an 18-week build to the Manitoba Marathon on Sunday, June 18th. The start of a new training block brings promise, but it also makes me nervous. The future is always uncertain. I’m excited to see what it holds for me. Using some user automation via Workflow, I can quickly post a status update to a Jekyll blog hosted on GitHub Pages. It’s not quite as clean as IFTT’s “Publish to WordPress” applet, but I am seriously considering moving all my content into this system. I just want to reiterate how many learning opportunities are available to anyone curious about the web. I’m not a developer or even close to it, yet with some patience, I’ve set up this Jekyll blog hosted on GitHub Pages thanks to the patient and helpful explanations of real developers. Now, with a bit of automation via Workflow, I can send a quick post to my site and have it live immediately without any unnecessary demands on me as a user. A little patience goes a long way. Through my day job, I’m regularly exposed to innovative work happening in educational technology and open educational resources. Some of the time, a project peaks my curiousity enough that I can’t help but dabble in the technology myself. As of late, this led me to installing a CMS called Grav to create an “online course hub” that can be used with GitHub to create an open, collaborative platform on the web. Here’s what I’ve learned. In a small stroke of fate, the Menzingers and Japandroids, two bands that five years ago struck lightning in their respective bottles on either side of North America, released new albums on the same day last week under the same parent label, Epitaph Records. With the releases of each, After the Party for the Menzingers and Near to the Wild Heart of Life for Japandroids, the two bands now find themselves in the same predicament: How does a band move on from the album that many will forever consider their masterpiece? As a result, Near to the Wild Heart of Life takes greater risks. After a familiar, quick and dirty rock banger to kick the record off, they gradually introduce a few new elements into their repertoire—some synths, more introspective lyrics, and even a sweeping seven-and-a-half-minute ballad. They may not have completely reinvented what it means to be a Japandroid, but it’s clearly a deliberate effort towards evolving. After the Party, on the other hand, sees the Menzingers maturing a bit, tackling the problems that come with hitting one’s thirties, but musically, delivering more of what put them on the map. Originally posted as a comment on Clint Lalonde’s blog. In my year in review, I mentioned that I want to listen to more music in 2017. It’s been some time since I’ve kept up with current releases from bands I enjoy, but anticipating albums is a familiar experience for me. I’m happy to report that this subtle change to my “media diet” is a welcome one. Let’s start with a question: What’s worse, “fake news” or the inability to think? When I first moved this blog over to Ghost, I had ambitions to write more and put more of my stuff on the web. After all, what’s the value of controlling and owning your own domain without building a productive space for writing and thinking? One of my quirks is an obsession with trying to perfect my “media diet.” I’ve written before about the problem of Total Noise and how it affects our world in countless ways. As we close the book on 2016 and look forward to 2017, it’s something I continue thinking about as a central and representative aspect of modern life. It’s not a problem I can solve for everyone, but it’s something I can work on in my own life by reflecting on the information and entertainment I consume and why. Lately, I’ve been investigating a few different solutions for public-facing course websites. Why does it interest me so much? I spent several years in the classroom as a student, and a few more as an instructor. My growing interest in basic web “hacking” and “development” (I put those in quotes because I’m ignorant of both) has led me to imagine what a course “optimized for the web” might look like. This is an entire field of study, of course, and I’m fairly new to it. Most of my contributions include shallow assessments and blanket statements like “This is cool” and “All courses should be like this!,” but curiousity is how I learn, so I’ll continue fumbling blindly through the darkness until someone tells me not to. Several months ago, I decided to start taking my “digital footprint” a little more seriously. Like most people these days, several parts of my job require me to be active online, and through the projects I work on, I am closely involved with web development and on the periphery of educational technology. I have also been immersed in the work being done around open educational resources and open pedagogy, which rely heavily on using new technology to enhance teaching and learning. The community (or “network”) of open educators includes prolific bloggers and hackers: they use the open web to create, connect, tell stories, and share outside of the “silo” that is the Learning Management System (or the ubiquitous social networks essential to how we experience the web now). The first instalment in Trent Recommends is Sheila Heti’s How Should a Person Be?, a “novel” that shows the promise and emotional range of an emerging talent in Canadian literature. The 20th anniversary of David Foster Wallace’s Infinite Jest just passed. This is the abridged version of what Infinite Jest has come to mean in my life through my trials and tribulations with the novel’s first episode. There may be mild spoilers but I try not to reveal too much. I hope you enjoy. Find me on Twitter to share your thoughts. Twitter’s well-earned reputation as a massive time sink is not without merit. Occassionally, however, you stumble across a thought expressed so succinctly it makes all those hours of passive scrolling worth it. Clint Lalonde’s blog is one of the inspirations for my (re)commitment to blogging, and he regularly shares perceptive commentary about the role of openly licensed content in education. As you can tell from his blog, he also knows his way around ed-tech. In the not-so-distance past, when I was growing up and technology was growing with me, we published content to the web by messing around with free internet services. The “content editor” was a plain text box where you put HTML.